First at the South Pole. 060. FIRST AT THE SOUTH POLE. Issued by Kellogg Company of Great Britain Ltd. (1963). Card number 6 from a set of 12 entitled "Famous Firsts". Size: Ca. 2.6" x 1.42". Verso: A SERIES OF 12 No. 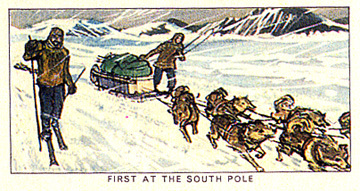 6 | FAMOUS FIRSTS | FIRST AT THE SOUTH POLE | The Norwegian, Roald Amundsen, with only four other men and four dog-sledges, travelled 1,800 miles to the South Pole and back in 99 days. On October 19th 1911 they set out from the Bay of Whales, which they had reached in the polar ship Fram, on an exhausting journey over treacherous, crevassed surfaces, through howling blizzards. On December 14th, having examined the sledge meters, "Halt" was called. Observations showed them approximately Lat. 89° 54'S. On Dccembcr 16th the expedition moved on south. Later observations were completed at noon December 17th, when flags and a tent were set up as near to the Pole as their instruments made possible--a little over 59 days after setting out. Inside the tent, Amundsen left a letter to H.M. the King of Norway and one to Capt. Scott. | ISSUED BY | KELLOGG COMPANY OF GREAT BRITAIN LTD. Note: Image and information courtesy of Evan Jones, Wiltshire, England.